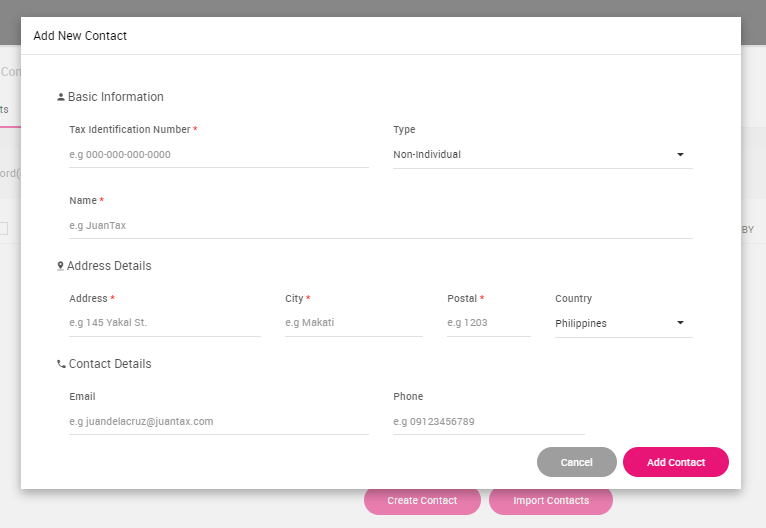 Add a list of contacts straight into your JuanTax account. There are two ways on how to put your contacts in JuanTax. You may either (a) create the transactions one by one using the system or (b) import your contacts using a csv file. 2. Click the Create Contact button. 3. After that, you can manually fill up the form before saving it by clicking the Add Contact button. Note: Always remember that there are NO LIMITS when it comes to the number of contacts that you can import within JuanTax. Prepare your CSV file. You may also extract your SLSPs as a CSV so you do not need to re-type it again. Make sure your CSV file has a header. Type the name of the header which best describes the whole column. We will later map those headers with the corresponding fields in JuanTax. Click on the menu on the upper left-hand side of the dashboard. Click on Contacts > Import Contacts > Browse. Select the CSV file you wish to import. Map the appropriate fields from your CSV file to JuanTax. Make sure you MAP all the fields applicable. Note: Do NOT click on next until you’ve seen the mapped items. Review the items if it belongs to the correct column. If you’re good with it, finish importing the items.